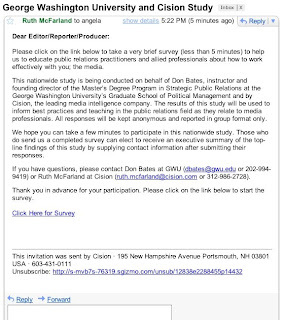 Please click on the link below to take a very brief survey (less than 5 minutes) to help us to educate public relations practitioners and allied professionals about how to work effectively with you; the media. Use my name. Or do that nifty direct mail auto-replace thing with Word. (You have Word, right?) Nobody needs to know how wide -- how very, very wide -- you cast your eager net. Master the (subtle) difference between a colon and a semicolon. God help those public relations practitioners and allied professionals. Full letter here.